I don’t know if anyone knows this about the Inspired Chef, but I grew in the suburbs of Cleveland, OH, a nice Jewish girl who loved to celebrate Christmas. I always looked forward to hanging the ornaments on my grandparents’ Christmas tree and couldn’t wait to get up early Christmas morning to spill out the contents of my stocking and open up my presents. At the all-girls school I went to we practiced our holiday carols for weeks before the Christmas Concert (now called the holiday concert to be PC). Thus, I was in for a rude awakening when I moved to New York. Apparently none of my Jewish friends were going to invite me over to decorate their trees or have Christmas Eve dinner like they did back in Cleveland. So, I am very indebted to my Christian friends who have shared their holiday traditions with me. My friend Doreen was kind enough to make me a batch of Cappelletti Soup, which she serves her family to start off Christmas dinner every year. Cappelletti means “little hats” in Italian, but Doreen says, “When my grandfather brought the recipe over to America from Rimini, Italy, the pasta got flattened in translation so that our family now makes it in a ravioli shape.” She remembers growing up watching her grandmother rolling out the pasta dough in one whole sheet on the table. 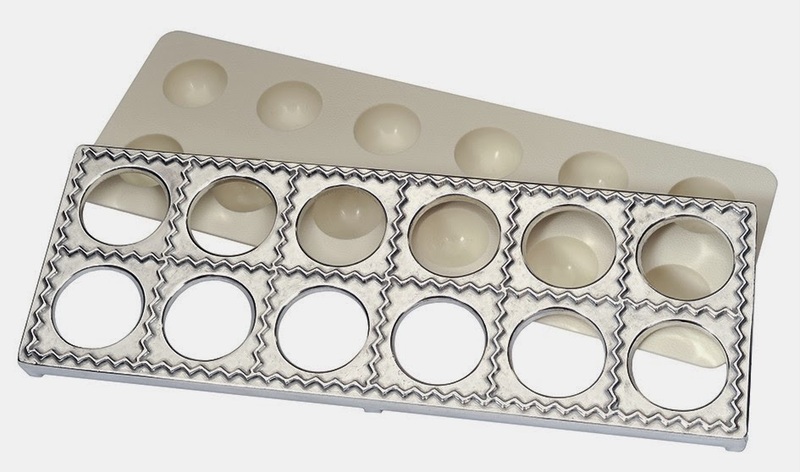 Doreen makes her own pasta too, but uses a pasta roller and ravioli tray to cut the pasta sheets into small squares that she fills with a ricottabased mixture with lemon zest and nutmeg. The cappelletti are served in a chicken broth and topped with freshly grated Parmesan cheese. Intrigued by making this, but not wanting to spend four hours feeding pasta through a machine, I called up my local Italian deli and asked if I could buy the sheets pre-made. The answer was yes, but they wouldn’t be thin enough for ravioli, so I’d have to pass the sheets through the roller a couple more times to thin them out. I might recommend this route, unless you are a stickler for family tradition, in which case, I totally understand. Wishing you all the happiest of holidays and merriest of Christmases. And call me if you need help trimming your tree! Beat eggs, add cream cheese, and then mix in a blender. Add the rest of the filling and mix in blender. Set aside in refrigerator. Make 8 batches of this so you can use Cuisinart, mix till it comes together. Use extra pasta as fettuccine. Flatten dough so that it will fit through the rollers of a hand-cranked pasta machine. 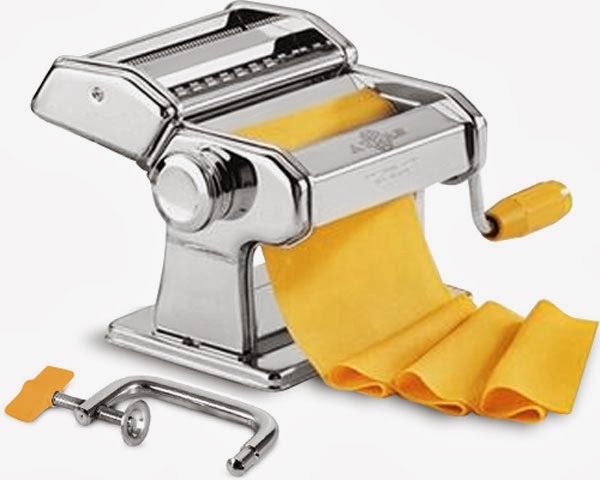 Set rollers of pasta machine at the widest setting, then feed pasta through rollers 3 or 4 times, folding and turning pasta until it is smooth and the width of the machine. Roll pasta through machine, decreasing the setting one notch at a time (do not fold or turn pasta), until pasta sheet is about 1/16 inch thick. Lay a bottom sheet of pasta over a well-floured ravioli tray and fill pushed-down centers with about a 1/2 teaspoon of filling. Slightly wet the edges then cover with top layer of pasta. Use a rolling pin to press the two layers of pasta together. Start with gentle pressure to press out any air and to form a seal. Then use more pressure to cut the pasta into individual ravioli. Peel off excess dough from around the ravioli. Turn the ravioli maker over and give the mold a shake. 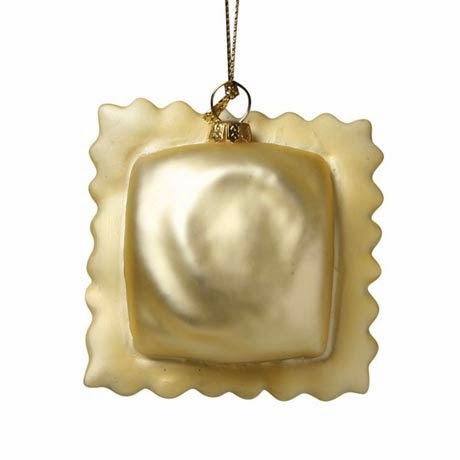 The ravioli should easily fall out of the mold. If they don’t, tap the edge of the mold against a firm surface such as your countertop. (details here). You can freeze them on cookie sheets so they don’t touch and then put them in Ziploc bag. Will store for months. Make a chicken stock. Simmer it (do not boil or cappelletti will fall apart) Place fresh or frozen cappelletti in soup and simmer 20 minutes. Do not stir, just gently push down into stock to move it gently. I love this story and soup recipe. You can always help us decorate the tree. Dave’s the most enthusiastic! Glad to have you decorate our (Cindy’s Tree) when you come visit us.